This blog contains some content which may be considered offensive to certain viewers. 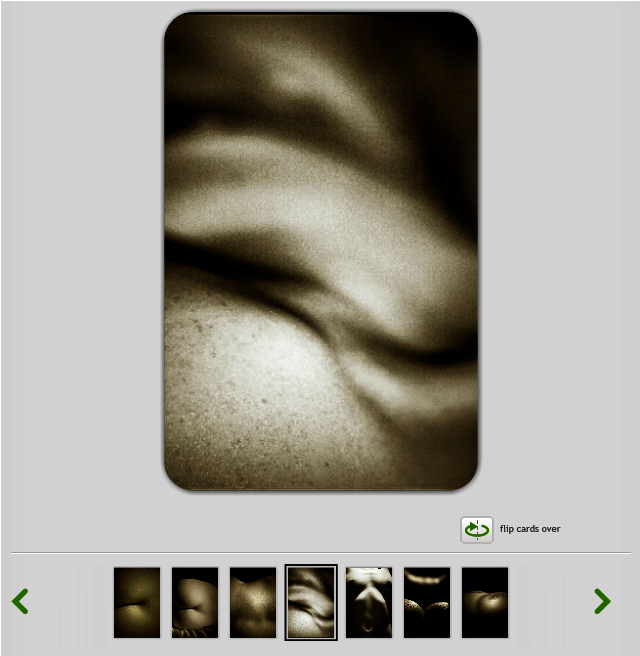 The work shown here is produced in line with my role as a professional photographic practitioner and student. If you feel that you may be offended by any content then please close this webpage or redirect to another URL now. Having spent a great deal of time researching about Art Therapy as a career and the courses that are available for me I could write an awful lot of information on this one blog post. However, that would just be tedious and boring so here is a youtube video explaining what art therapy is and specifically what it does for it’s patience. Here is a link to the home page of the British Assosiation of Art Therapists. What is art therapy? If you follow this link it will take you to a dedicated web page within the British Assosiation of Art Therapists website which will expand into great detail about what art therapy is. This link shows all of the current postgraduate university courses that are running within the Uk. It is this page within the website that I have used to help me with sourcing a relevant course to apply to for next year. 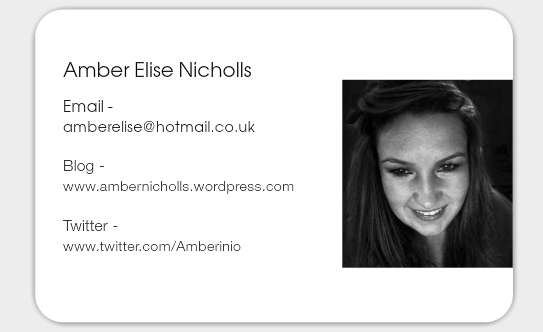 Below is a screen shot of the seven business card images that I have used. Here is the information and image that I have used on the back of my business cards. 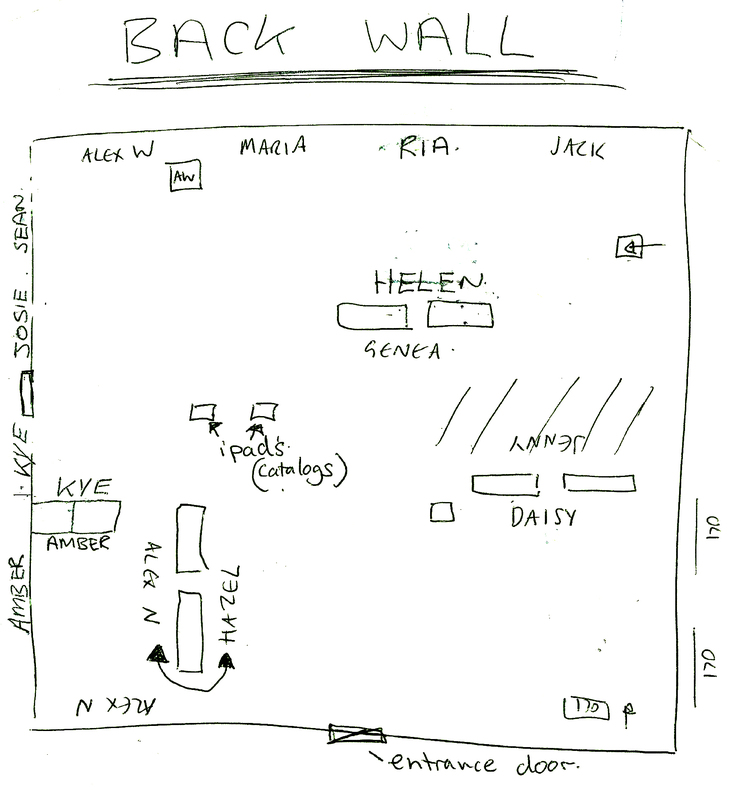 Here is my first (very rough) planning of the gallery space. With this first drawn up plan I was allocating spaces to my fellow students to see how the spacing would work out (roughly). It was at this point that I was worried about where to place the false walls, to increase space within the gallery, whilst still enabling the viewing space to flow freely rather than being blocked off. This second gallery sketch was aided by the curator of the Lancaster Gallery – Sadie. 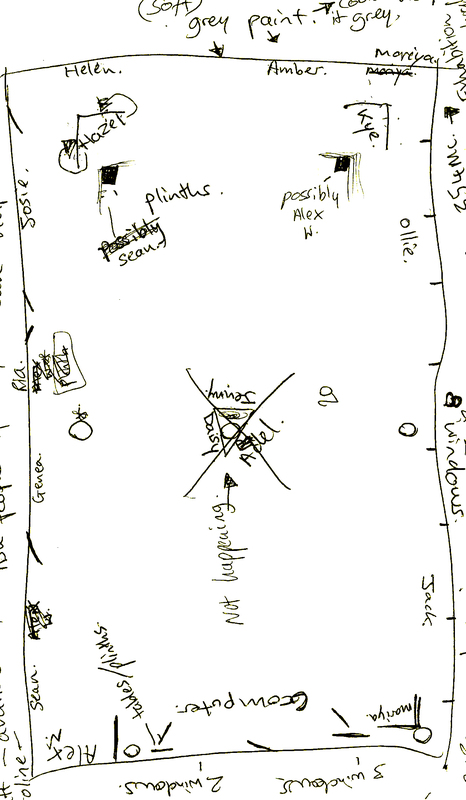 Although this is a very simple sketch of the space it clearly shows the placing of people within the gallery. I also feel that through using the false walls and having them situated within the floor space (end on towards the windows), enables the greatest amount of natural light to enter the space, furthering the free flowing aspect of the gallery that all of us wanted to achieve. The boxed off corner on the left hand side also serves a purpose to conceal the graphic works from viewers, so if they wish to not witness the work they can move on to the other work within the exhibition. It’s other purpose is to block out some of the light from the windows so that the projection would be clearer. 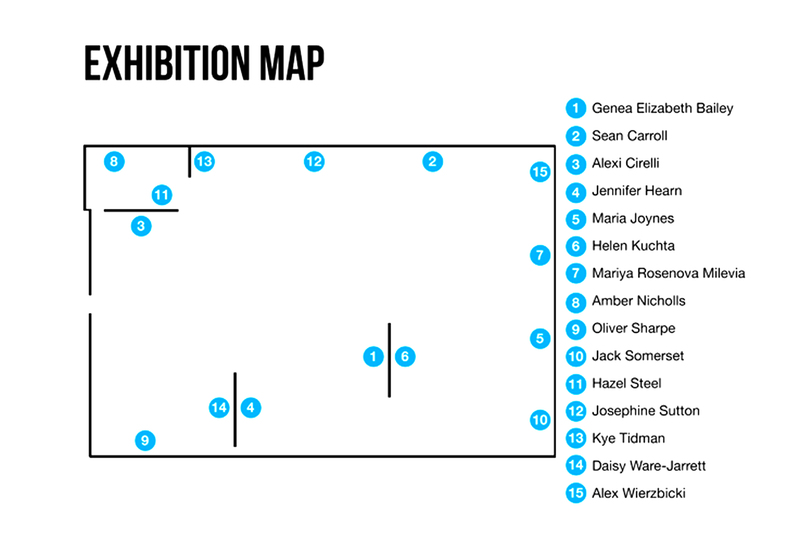 Here is the final exhibition map which can be viewed on the digital, internet based degree show catalogue. Having looked around the gallery space both me and Mariya, decided to look into ways to utilise the space that we have secured for the degree show/exhibition. Firstly we both decided that we need to somehow make use of the great expanse of window space. To make the space useable I looked into ways of hanging imagery in front of the widow panels. It was at this point that I did some extensive internet research and came across this website that has many diversely different ways of hanging imagery. Having looked through the website (above) both me and Mariya (having also spoken to our tutor Paul Smith), decided that the vertical or horizontal wire method of hanging work would be the best alternative to wall space, if there ends up being a lack of space for everyone within the class. The other alternatives that we both thought up, were utilising the eight false walls within the galleys floor space. There are three different ways that we decided that we could have the false walls. Place two walls (that are 4 foot wide and 8 foot tall) together, creating a right angle, in all four corners of the gallery space, this would intern yield wall space on both the inside and outside of the false walls. Putting three walls corners/sides together, around one of the centre pillars to create a walled triangle space, thus intern concealing the ugly pillars. However this does not yield the greatest amount of wall space. pacing two walls parallel to each other (end on) with a 2 cm gap in-between the two pillars closest to the windows, and then another two false walls closer to the entrance door, parallel again. This would create a staggered effect when looking into the gallery space. Further more there would be another set of paralleled false walls a metre and a half away from the entrance door these would be front facing and would create a boxed off corner for the projection. Have produced an equipment list for all of the students a while ago, I found that the list regularly evolved at the same pace as the projects did. Thus I had to keep altering this equipment list.However this was the final one. Oliver sharpe – One apple mac screen, plinths & headphones. Alex Wierzbicki – One apple mac screen & headphones. Alex Nisbet – Projector, headphones, plinth & DVD player. Sean Carrol – One apple mac screen, and head phones & plinth.